I am thinking about getting a similar cabinet. I notice from your pics that it appears the server is mounted flush against the wall on the right-hand side. Did you not make use of the swing hinge or can the cabinet open from the back? My setup will be inside a hallway cupboard so I wont be able to use the swingout, however, I still want to get the swing unit because of the addtional depth of around 100mm. Do you think there would be any issues hard mounting on a wall and not making use of the swing? Also how sturdy is the unit wall mounted. At 32kg empty I imagine it would need a fair bit of extra supports in the dry wall. a 19 inch rack is wide enough to be mounted on two studs, but even one is enough to hold it up.. The rack is mounted in an enclosed room underneath my house with exposed studwork. I didn’t have any of the tools to cut and fit new noggins to the studwork so I fixed a sheet of 12mm ply to the framing to transfer the load. Three of the screws on the right of the case in the picture are into a stud while the other three on the left are into the ply. The ply is screwed into the studs and also adhered with liquid nails. You can get 20kg load rated plasterboard screws, but personally I would always try to get at least line of screws in a stud. The rear of my rack is fully enclosed and I can't access the back of it directly. I definitely make use of the swing hinge as it would be really difficult to get to the rear of my equipment otherwise, even with removable side panels. The rack depth is 540mm (including the hinges) and that is just barely enough to get the cables out of the front and back of my equipment. The maximum equipment depth I can use is 390mm, as I need around 75mm front and back. Most rack mount NAS start at 430mm, and most server cases at 540mm. 390 severely limited my equipment options (see my server build log). If it is in a cupboard you could always just buy the vertical rails and knock up some framing using 4x2. The more depth and fewer restrictions you can give yourself, the better off you’ll be. That will work well. Sounds like your on the money. The trick with any wall-mounted network cabinet is just that, they are a network cabinet, not for heavy servers. now just need to concentrate on this. I would not go for a 550mm deep rack if you have any intention of putting rack-mount server or NAS gear in it. You lose 70mm in the front of the rack for handles, cable management, etc, and around the same at the rear of the rack for cables and airflow. My rack is 540mm deep (although specs said it was meant to be 600mm) and I just have enough room at the back of my 390mm deep UPS. Most rack mount severs and NAS start at around 430-450mm so that extra 50mm of a 600mm deep rack makes a difference. There are short depth server cases available at 387mm but they are very tight inside and few in number. I've just bought a 550mm deep case (Norco RPC-450) and was planning on a 600mm deep rack, would this fit?? No. Gives you no room for cabling and airflow. No it won't. As I mentioned in the text you quoted, you'll need around 50-70mm in front of the case for cables and the handles on your case (if you have a front door/panel), and then at least 70mm at the rear, which is just barely enough. 700mm deep would be the absolute bare minimum, with 800mm being preferable. Damn, there goes my idea of wall mounted, already bought the case. Thanks! cause it'll be sticking out 800+mm from the wall? cause you can't get to the back? oh but you can get hinged racks you say? but they're made for patch panels and maybe a small switch, not 20+kg of server. now ignore that if you've got a microserver, but then why have a rack? cause it'll be sticking out 800+mm from the wall? cause you can't get to the back? oh but you can get hinged racks you say? It'll be sticking out 800mm even if it's not attached to the wall, and does it matter if you can't get to the back if you can still access the back through the front? If you're not needing to be in the rack all the time, I would think it might be beneficial to have it up high and out of the way, provided of course it's fixed properly to the structure of the building. I have around 40-50kg of equipment in my hinged rack (see my post above). While the rack is rated to 80kg it flexes enough so that the alignment pins don't align and I need to lift and push quite hard to get the rack to lock closed properly. If I'd spend an extra $100-$200 on a rack with larger wall thickness it may not have been an issue. 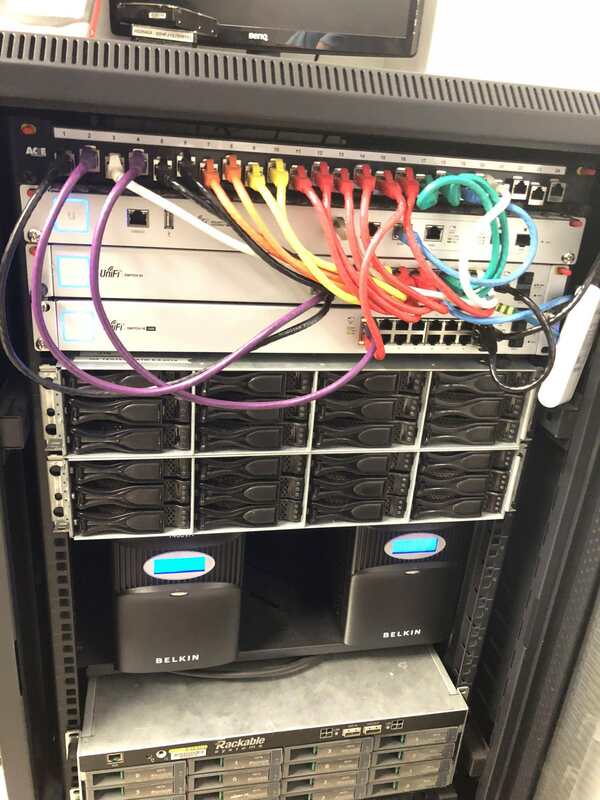 The benefit of having rear access to the back of the rack is that you don't have to work by feel or pull equipment out of the rack in order to see what you're doing. Well this thread hasnt been updated for a while, how about them rack picks?? My messy and rediculously oversized rack in the garage, and most of the cables haven't even been run in yet!